Pope Francis Believes He Is Not One To "Judge A Gay Person"
Pope Francis did something quite un-Pope like over the weekend while traveling back to the Vatican from Rio's World Youth Day. 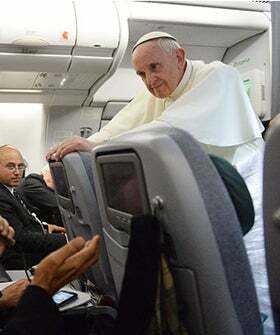 During a press conference aboard his plane, The Wall Street Journal reports that the pontiff talked candidly about the Vatican's rumored gay lobby, jokingly saying that if there was one, he has yet to see it "stamped on anyone's ID cards." He then went on to express a certain level of openness towards homosexuals within the Catholic faith: "Who am I to judge a gay person of goodwill who seeks the Lord? You can't marginalize these people." Now, before anyone busts out their pride flags and takes to the streets proudly proclaiming the Church is LGBTQ friendly, this is merely one quote referencing celibate homosexual priests. Pope Francis' statement is more of an indifference rather than an argument for equal rights — he's not directly coming out and saying the Church embraces the LGBTQ community, but that doesn't mean we brush it off either. It is the first time a Catholic official, let alone the head of the Church itself, has expressed anything other than animosity towards the LGBTQ community. "If someone is gay and he searches for the Lord and has good will, who am I to judge?" the Pope asked.